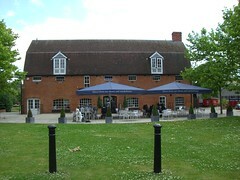 Loch Fyne is a chain of fish restaurants that has a premisis in downtown Reading on the banks of the river Kennet. Loch Fyne restaurants serve only line-caught fish. This scribble was published on Sunday, November 9th, 2008. You can follow any banter on this scribble with the RSS 2.0 feed. You can share your inspired musings after typing the anti spam word near the bottom of the page. But no Pinging because its too naughty. Not fish out of the Kennet, I hope!